Ruben Jaen was a renowned cardiovascular surgeon and big game angler in Venezuela who applied the same research skills, dedication and enthusiasm to the sport of fishing as he did to his specialty of medicine. In 1957, he pioneered the replacement of the carotid artery with a plastic prosthesis. He authored six books and hundreds of papers, and received numerous awards for his medical accomplishments. Jaen began fishing for peacock bass, payara, tarpon and snook at age 12 . At 22, he discovered billfishing. But he and other early anglers lost more fish than they caught, even though they were using the same baits, hooks and leaders as Zane Grey, Kip Farrington, and other greats. While tarpon fishing in Cuba in 1956, friends persuaded Jaen to try a lighter leader, insisting the fish were spooked by thick line. When he returned to Venezuela, Jaen and Freddy Benarroch began experimenting with #4 wire for white marlin and sailfish and enjoyed great success on the international tournament circuit. Jaen described these techniques in his 1964 book "Fishing in the Caribbean", and they were quickly adopted by anglers around the world. In 1966 the Venezuelans convinced the International Light Tackle Tournament Association (ILTTA) to bring its 20-pound competition to their country. After 281 billfish were caught over three days in La Guaira, a new angling hotspot was born. Turning his attention to Caribbean swordfishing, Jaen adopted the Cuban method of drifting at night with baits at 200’ depths. On July 22, 1978, he landed the first two broadbills on rod and reel in Caribbean waters. In 1992 he introduced deep-dropping for swordfish during daytime hours. Jaen had always dreamed of catching a grander blue marlin and after he landed a 1,018-pound bluefin tuna at Prince Edward Island, Canada in 1979, his quest intensified. On December 30, 1994 in his home waters of La Guaira, Jaen scored his prize catch-- a 1,056-pound blue. Jaen became a leading conservationist in Venezuela, convincing the government in 1986 to designate a 5,000-square-mile protected zone around the La Guaira Bank which banned commercial fishing and safeguarded billfish breeding grounds. 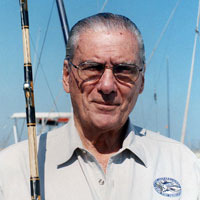 In 1978 he was appointed an IGFA Representative, became the first South American member of the Board of Trustees in 1989, and in 2005, named Trustee Emeritus. Other angling honors included the 2003 Gil Keech Heavy Tackle Award; first recreational angler inducted into the Venezuelan All-Sports Hall of Fame; member of 12 winning teams in international tournaments; and IGFA 50--pound-line world record for an 804-pound blue marlin.